I’m not sure if there is a proper word for these characters, so I’m calling them “sub-verbal” which means any character who speaks in gibberish. 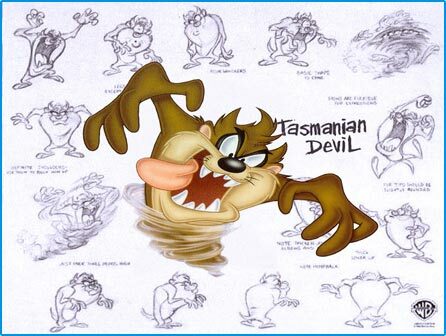 The Tasmanian Devil is probably the most well known cartoon character to sound this way. He was occasionally able to get out some English, but is generally known for his animal sounds. Another of the great sub-verbal characters is the Muppet, “Swedish Chef”. Throughout his faux-swedish, he would pepper in some understandable English. I believe he now works as a writer for Ikea catalogs. But one sub-verbal character that is on his way to being forgotten is “White Fang” from the Soupy Sales show. White Fang and Black Tooth were both supposed to be dogs, but all you see are their “arms” which reach into the scene. White Fang is very argumentative, and very entertaining. And this gem featuring Alice Cooper. Grammelot is a term for a style of language in satirical theatre, a gibberish with macaronic and onomatopoeic elements, used in association with pantomime and mimicry. The format dates back to the 16th century Commedia dell’arte, and some claim Grammelot to be a specific universal language (akin to Lingua franca) devised to give performers safety from censorship and appeal whatever the dialect of the audience. Here is the video that introduced me to grammelot. Acting Tips from the Commedia Dell ‘Arte. The Taz and Chef are two of the greatest characters, sub-verbal or verbal! While I didn’t see White Fang and Black Tooth during their original run, I’ve become familiar with them thru various Soupy tributes and documentaries. Would the Road Runner count? All he said was “Beep Beep.” Similarly, The Grape Ape from the cartoon of the same name only said a few names. The Jeep from Popeye only said “Jeep.” However, Popeye the Sailor Man himself would certainly count, as would others in the strip like Alice the Goon and Pops; and in the old Max Fleischer cartoons, nearly everyone mumbled, even Olive Oyl and Bluto. Not counting those that just made animal sounds/barks such as Pluto, Dino (“The Flintstones”), and Lassie, other such characters (not just in animation) would be Gossamer (Bugs Bunny nemesis), Grog (from the comic strip “B.C.”), Astro (“The Jetsons”), The Shmoo (“Li’l Abner”), Mr. Magoo and possibly Scooby Doo. In live action TV, one could make the case for Mr. Bean as he was always mumbling. That’s just off the top of my head; if I were to do a little research in my library I could probably find more, especially in comics. I agree with Mr. Bean, for sure. He manages to push out some recognizable words among his sounds. I also thought of baby characters, such Jack-Jack from the Incredibles, or Pebbles from The Flintstones.